I don’t know about you, but I always get intrigued when a new Biopic pops up and is released. There’s something about watching and learning about the life of someone, that quite often you don’t really know much about. Finding out who they were, what they did, and why they were so important in the world in which we live. That is definitely the case with the new 2015 Biographical Drama ‘Trumbo’. Directed by Jay Roach and starring Bryan Cranston as Dalton Trumbo and Helen Mirren as Hedda Hopper, one of America’s top gossip columnists during the 1920’s and 30’s, this film looks like it could be a very interesting watch. 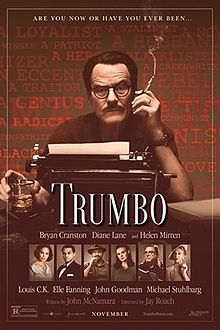 As you would expect, it delves deep into the professional and private life of Trumbo, who was an American screenwriter accused of inserting and promoting communism influences into the film industry in the 1940’s. Notable credits to Dalton’s name include A Man to Remember and Kitty Foyle which was nominated for an Oscar. Due to his relationship with the Communist Party USA, he had to cease publishing his name on his works for a time. With the outbreak of World War Two slap bang in the middle of Trumbo’s success, and with all the other historical goings on at the time, this is definitely going to appeal to the masses. With Jay Roach at the helm, I am sure that this film will be a great success. Having previously directed films from the Austin Powers Franchise, Meet the Parents, Meet the Fockers, and many more, I am sure, as the trailer has shown glimpses of, the comedy elements will be there. But this film has a serious side to it, which myself personally hasn’t seen Roach achieve before. Perhaps he wants to move his directing skills into a new genre of film. Who knows. Having seen that this film is not being released in cinemas until November in the US and 22nd January 2016 here in the UK, we still have a while to wait before we can have a glimpse of what I hope to be a fascinating piece of cinema.